YoYoExpert Blog & Yo-Yo News – New MonkeyfingeR Release! The CONSPIRACY! CONSPIRACY THEORY? Not anymore. This is a CONSPIRACY REALITY! 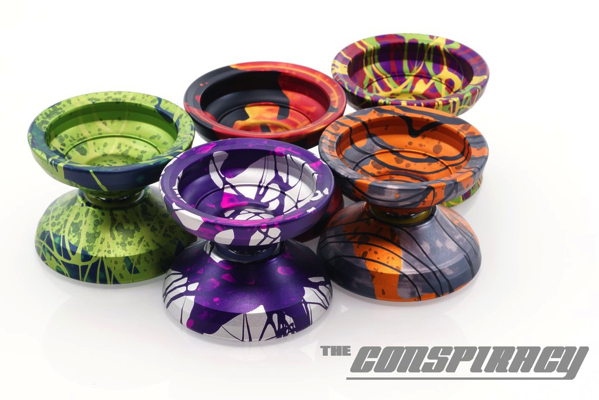 Introducing the second team-built yo-yo from MonkeyfingeR Design – THE CONSPIRACY! A complete departure from their first team-built model, the Tri-B, The Conspiracy was built to meet the ever evolving needs of the MonkeyfingeR team. They wanted a yo-yo capable of taking on the highest level of competition and that’s exactly what MonkeyfingeR delivered! The Conspiracy has a fast maneuverable feel in play with a comfortable feel in the hand. It pushes the limits with a massive catch zone, powerful spin, and impressive stability through combos. As the latest MonkeyfingeR release since the PixelApe, The Conspiracy has been a long time in the making, and it does not disappoint! Available in a variety of stunning colors that MonkeyfingeR is known for!